Napa Valley is at the centre of the wine trade in California. It is also incredibly beautiful, full of vineyards and rolling countryside and is next to the Sonoma Valley another great wine producing area. The valley which is north of San Francisco has a lovely Mediterranean climate, and this combined with the volcanic and marine soil from millions of years of enrichment produce grapes that make great wines. This is a taster of what we did on this visit to this stunning area. 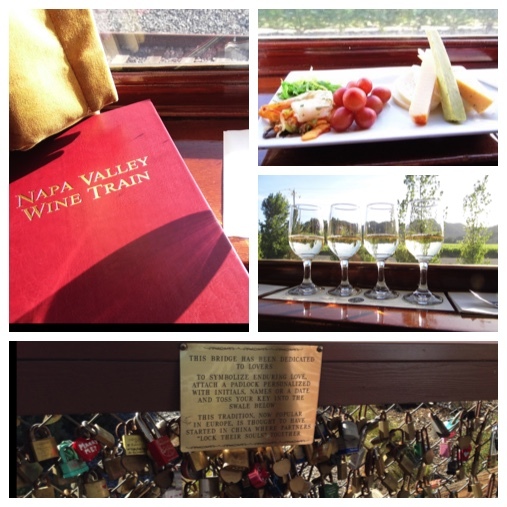 Our first night was spent visiting the Napa Valley Wine Train. This old historic train is made up of cars from the 1915 era and was the height of luxury at the time. You travel aboard the wine train taking in the breathtaking scenery and enjoy a meal in a historic train. Prior to the journey, we were given a talk on the history of the train and a short video then we were led to the train via a bridge. The bridge leading to the train was a love lock bridge, the bridge was covered with 'lovers locks', a custom dedicated to lovers all over the World. We were then taken to a carriage with seats facing the window. After an introductory taste of wine and an appetiser, we watched the scenery go by. After a while, the train stopped at the bottom of the valley and then we moved into a dining car. As the sun sets this area is particularly beautiful. Here we had a 4-course meal with tea coffee and soft drinks in elegant surroundings. Wine and other drinks can be bought to compliment the meal. My husband had a flight of wine - with each glass of wine information about the region, flavour and type of wine was given. This was a lovely touch, as the wine was excellent and the information was interesting and relevant. The food was very good on the Wine Train, highlights included a roast beef tenderloin for the main course which was melt in the mouth and a gorgeous chocolate dessert which was simply divine. Unfortunately, my photos were not good enough to share but please take my word for it! The service on the Wine Train was excellent and the star of the trip was the beautiful countryside and the lovely historic train. Here is a short video giving you a feel of the Wine Train. We ate at Celadon, in Napa one night and this restaurant didn't disappoint. Celadon has really great California food in a rustic setting. Recommended by Zagat we all enjoyed our meals here and would visit again in a heartbeat. We ate calamari with a dipping sauce, a tasty pasta ragu with pork, and lamb cous cous which was fragrant and light. A lemon meringue pie for dessert was sweet but also sharp and the biscuit base had the right level of crunch -a perfect end to the meal. We visited Oxbow public market. This undercover market in Napa also has a farmers market on certain days which we, unfortunately, missed, however, this little market is a foodies paradise. As well as stalls selling everything from fresh fruit to meat there are a number of cafes and restaurants selling snacks and meals. We had a coffee and sat people watching on a bar stool. We then wandered through the market tasting flavoured olive oils, chocolate and other nibbles. The highlight of our visit to the area was a visit to a vineyard. There are numerous wineries and vineyards so I researched which was the best for a beginner's guided tour into how wine is made. 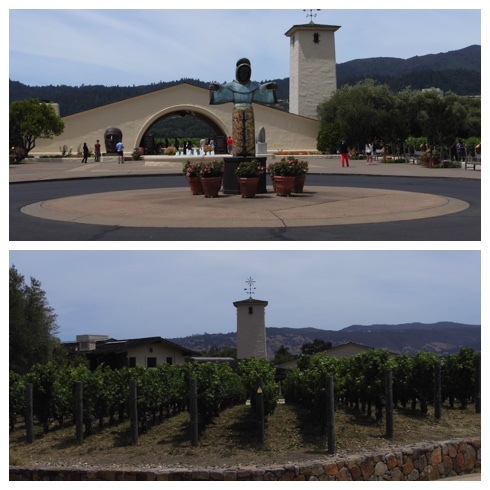 I decided to try the Robert Mondavi vineyard and winery. For 35 dollars each, you get a guided tour following the grape from vine to processing to tasting. I really enjoyed this insight into how grapes are grown and especially the wine tasting. Napa is known for its Pinot Noir and we had a tasting of four wines including a big bold Pinot Noir with berry flavours and a Sauvignon Blanc which was crisp and fresh with acidic flavours. Traditionally I was always thought white wine should be served with chicken and fish and red wine with red meat but did you know you can pair food and wine with the richness and fat level of the food, this is a tip I picked up here. 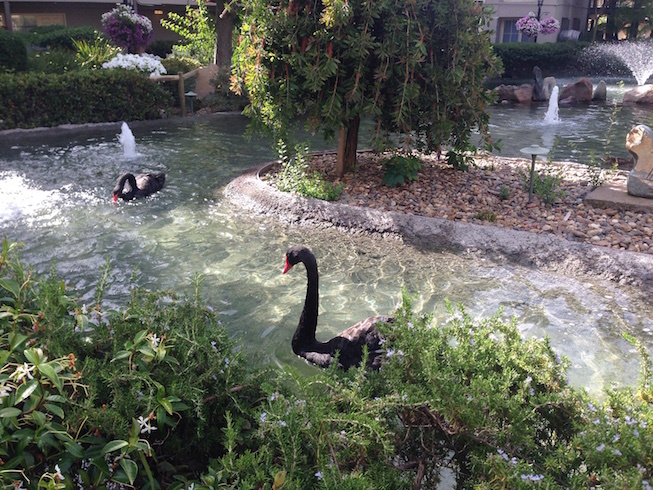 We stayed at the Embassy Suites Napa. This delightful hotel has beautiful grounds with a small lake populated with swans and ducks. Hotels in the area are highly priced but with a cooked to order breakfast and a complimentary drinks session in the evening we felt this hotel was super value for money. Sitting sipping wine and cocktails in the gorgeous grounds whilst nibbling on tasty snacks we did wonder if life could get any better. 1. Vineyards and wineries are quieter in the week. 2. If you are visiting on the weekend and want to book a tour, do so in advance as it can get busy. 3. If you want to try a few wineries, consider alternative transport to driving. You can hire bikes, or pay for a limo/driver to take you around for the day. Alternatively, spit out the wine - it is encouraged if you are driving and receptacles are available to do this. We only touched the surface of what the Napa Valley has to offer and with an equally delightful Sonoma valley next door, this is an ideal place to explore for foodies and wine lovers everywhere. Looks like you had a nice holiday. I need a vacation so badly. Hope you get the chance to go to Napa one day! It felt very grand but relaxed at the same time. We had a fabulous time, thank you. Wow it sounds and looks incredible! Tom and I had planned to go to San Fran next year but instead he's going with his guy mates.... lucked out there didnt i! 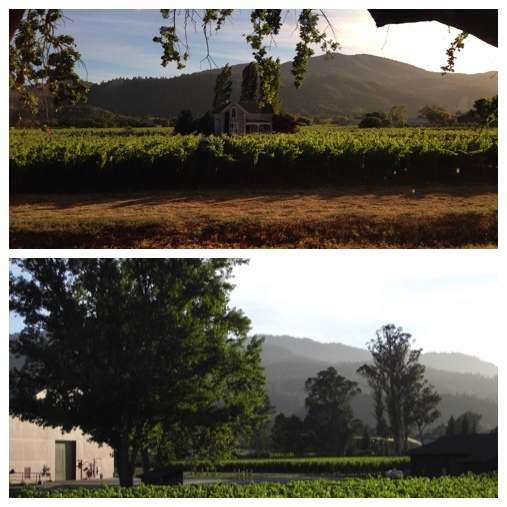 I've heard about Napa Valley so many times from the TV but have never been - looks like a lovely spot for a holiday and it'd be rude not to visit the vineyard, wouldn't it?!! It is a lovely relaxing place, and it would be very rude not to visit a vineyard wouldn't it! It really is a lovely place Michelle, I highly recommend the area. I think you would really enjoy Napa Valley Jen! How interesting - this looks like a great place to visit, thank you for sharing your experience there. Sounds a great location and hotel. I have never done any wine tasting. You should really try it if you get the chance. I learnt a lot on the tour. Highly recommended. It was amazing. I have more of my trip that I am blogging about too. This sounds amazing, what an experience. Love the sound of the market too. The market was fantastic, so many great food stalls and places to eat. That train looks fantastic!! I would love to visit california- one day eh! Hope you get the chance, the climate is lovely and it is one of my favourite places in the whole World.